…..After a lot of soul searching, I decided to resign my hard won commission. Part of me still regrets it (but I would return to Sandhurst on a special attachment six years later to write its history). 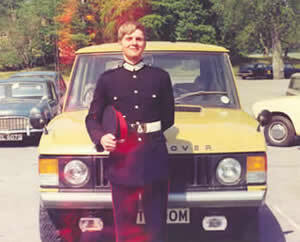 My last job in uniform was the words and pictures for a regimental recruiting brochure. The last words of my commanding officer were: "Mike, you're not thinking about writing about your experiences are you..." I wasn't, but he gave me a very good idea! Once released from the service, I went to London and did the rounds of the major papers and magazines looking for a job. I got a freelance offer from the famous but left leaning News Statesmen and went to Poland. It was 1981 and Solidarity was just happening. It was an exciting time and I wanted to be in the thick of it. I witnessed the riots in Warsaw and Gdansk. I jumped off a train in central Poland in which a huge fight had developed. I helped to smuggle ink into Solidarity’s printing presses through what was then East Germany and I was made an honorary member of the Solidarity press corps on the day of the General Strike in Warsaw. I returned to London, sold a few pics and netted another commission - from TIME the famous US Magazine. I was going to Syria ostensibly to cover the woman’s revolution and agricultural reform (well, you have to tell the embassy something). It was the Spring of 1982. Syria was a scary place. The day we arrived, they hanged someone near the hotel, soon after a couple of KGB goons tried to put the frighteners on me in the lift. I wanted a bit of excitement, but was not prepared for just how exciting it was going to get! Meantime, the colleague who accompanied me, a London picture editor and film maker, got seriously ill and had to return home. I had one or two health problems too (it is tough to avoid them in the Middle East). It is especially unpleasant to be sick in an alien place. One afternoon, I found myself - having passed out - in a Damascus hospital lying on a stainless steel trolley. I could see an old arab guy nearby. He had a drip in his arm and did not look at all well. Someone appeared, pulled the drip out of his arm and tried to stick it in mine. I had just enough strength to stop them. “I want a clean needle”. Later, whilst visiting Aleppo, an extraordinary, very ancient, place with a vast underground market, I had another bad turn. This time, I woke up to find myself being examined by a fat balding doctor with a grubby white coat and beads of sweat on his forehead. Ash dangled from the cigarette between his lip. He palpated my abdomen. I lost consciousness just as the ash dropped onto my stomach in slow motion. I came to, more or less, and saw an older, over made up, nurse coming at me with a huge syringe. I could not speak. She came close, squirted a little of the unknown liquid out and, concentrating intently, cleaned the large needle between her thumb and forefinger before sticking me. It didn’t hurt, and, I am still here! I returned to Damascus via a place called Hamma where the Syrians had just despatched 10 or 20 thousand of their own. They were alleged sympathisers of something called the Moslem Brotherhood. Now, of course, we understand the implications of radical Islam, it was new to me then. I noticed in Hamma a series of posters of the President, Assad (the Awful), that someone had machine gunned. I thought it would make a nice pic. Bad move. “Why do you take pictures”, a snake eyed man who reeked of death demanded “I was just admiring your architecture, you are so lucky to have the Roman relics here.” “But, why do you take these pictures.” I stuck to my line, brought out a fake roman coin and bored him away. Thank God. They had killed so many, I do not think one more would have made much difference. My approach in such circumstances is smile, talk (but don't really communicate) and talk some more. I call it the red herring ploy and it has saved my neck a couple of times. In Damascus, I made contact with the PLO. After winning some trust by frequent visits, I was blindfolded one morning and driven into the desert to see a training camp (note the pic above). I remember thinking as the cloth went over my eyes, is this it, will they really take me there? They proved to be perfectly pleasant, the blindfold was removed after about 45 minutes driving. An old man in civilian clothes guarded an entrance. He rose and saluted. I saw an AK next to his chair. Inside, I met the young Fedayeen ‘Wolf Cub’ recruits, watched arms drills (not bad) and photographed a set piece in which explosives were used and rifles fired. 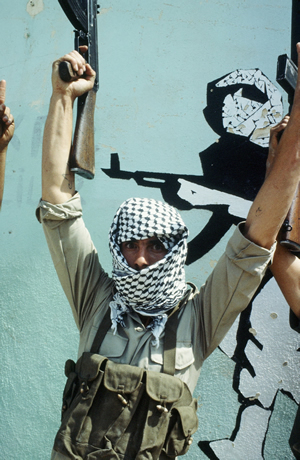 Terrorists or freedom fighters - they looked the part. This was usable stuff, money in the bank journalistically speaking, but I had also heard that a War in Lebanon was about to break out. I had the wrong papers and drove to Jordan immediately, where I had contacts. Documents acquired, I came back to Damascus and without delay got in a service car for Lebanon. Meantime, I had been given a full-time job by Time as a photographer. I passed through the Syrian armour massing on the border at night in a taxi with a Lebanese businessman and a nightclub dancer. We got hassled by the bored Syrian soldiers who tried to steel my equipment. I got angry and they gave it back. Initially, Lebanon seemed a pleasant place, we stopped for a coffee and cake in the middle of the night in the mountains above Beirut. A PLO or militia vehicle, a flatbed truck with a machine gun mounted on the rear, pulled in to do the same thing. “So these are the real guys”, I thought to myself. Arriving at the Commodore Hotel, I slept and met the Time head of Bureau the next morning. He confirmed terms. I was to be paid $400 dollars a day, plus a car and translator excluding bonuses for published pics. I drank in the atmosphere - a bit as I imagine Saigon to have been - the hard bitten hacks, the spooks, the paramilitaries, the unpredictability. It was quite a heady mix. One of my first assignments was to go and take pictures of street life in the main drag. It was all so familiar from TV (save for the nasty feeling in the pit of one’s stomach and the smell in one’s nostrils). No sooner had I begun to raise my camera than a ring of steel - Kalshnikov muzzles - surrounded my head. “Americani? ?” (Are you American?) “La, La, Inglisi” (No, No, English). “Who you work for?” “Time..” “Ah, Times of London…very good” “Ummm…[cowarding out]…you speak English well” “Yes, I was a student in London” “Really, where did you go” “London University” “So, did I” “Really, I had an apartment in Notting Hill Gate” “So, did I”. “You know my friends want to take you away” “I gather that” “This is not a good thing.” “I gathered that as well” “Come…we talk”. Guns are lowered, hands stop gripping, we walk to a nearby café. It dawned on me that the stakes were quite high now. I better not fluff it. We chatted about the good ‘ol days in London. We drank a couple of cups of coffee and, eventually, he seemed to relax. “Come, I want to show you something”. 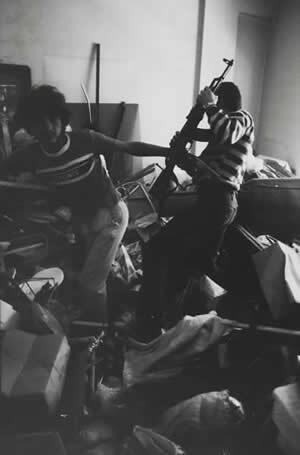 The something was an elderly Jewish man’s house being ransacked by teenage thugs. They suspected him of being a spy. Eventually, and it seemed an eternity, I was told that I could go by my new best friend. I did not know what to say, but asked my interrogator “What will happen to you.” “Oh, I shall get killed soon”. I soon had my first experience of coming under fire. We got attacked from the air on the coast road. It was truly terrifying - bowel shaking stuff. We were driving next to some anti-aircraft guns that were probably the target. As the noise of shells erupted, I told the driver to zig-zag as I was eating the carpet on the floor. We were inside the noise - attackers and targeted guns. It was extraordinary and horrible. I had to visit the downtown headquarters of the PLO to get official press accreditation. They were very unpleasant - unlike the PLO in Damascus. It may have had something to do with the Israeli bombing of nearby buildings - everyone was jumpy - or, I may have associated with a hostile branch in Damascus. The PLO, as I discovered, is riven by factions (then and now). The penny dropped, someone, the Israelis, was launching a strike run and I was standing outside the downtown HQ of the PLO right on the X. Blind terror again. I started running. I heard shouting. I ran towards it, my cameras clanking. There were some middle-aged guys in what was left of a building, they were in a crater and I jumped in next to them. Someone pushed my head down. The planes came. Happily, they hit something else. We all started to brush ourselves down and shake hands (as one does in such circumstances). We had survived another day in Beirut. Just as I was relaxing, I noticed a man in the distance gesticulating. He was in fatigues, about 45 and horrifically scarred on one side of his face. There was a boy with him in jeans and a T-shirt holding an AK. He was still twisting his face and hands. He had something between his fingers. It was a glass eye ball. It all became clear. He wanted me to take a picture of him as he re-inserted the eyeball whilst making a V for victory sign as his gesture of defiance. Simple really, I should have spotted it sooner. I took the pic and he went away happy as Larry. I went back to the relative safety of the hotel and had a meal pretending not to notice the rattling chandeliers. There was real camaraderie amongst the journos. One afternoon, I joined a German cameraman on the roof. He smoked some funny tobacco. We both watched the planes above and listened to the guns fire. Pretty surreal but strangely relaxing. Another day, a quiet American offered to buy me coffee. We went to a nearby place. 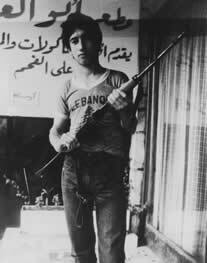 I took a picture of another boy in jeans and a T-shirt with a rifle. His big brothers came and objected. I went through a pantomime of rewinding the film and un-taking the pic. They were satisfied and left with smiles and handshakes having brandished guns initially. Quiet American looks at me at says in a knowing voice: “You handled that very well”. It suddenly dawned on me he was not the academic he claimed to be, I never did hear from the CIA. I would, by the way, make a great spy except for one thing: I can’t keep a secret. 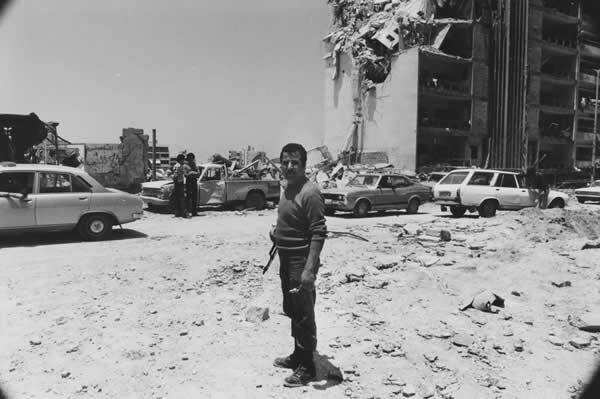 A few days later, someone trusted comes up to me in the lobby of hotel: “You’re on the PLO hit list”. “You’re kidding!” “No” “Come on, you’re kidding” “No, I’m serious”. I pondered this news for all of a minute and remembered my problem down town when trying to get the press card. I had subsequently been questioned by a French communist about some pictures of a PLO anti-aircraft position (she was a card carrying “daughter of the revolution”). Then, I went upstairs, scooped my belongings into a bag and went downstairs no more than five minutes later to find a car that would take me to the Christian part of town. The going rate to shoot someone was $50. Would you wait? I got to the harbour at Junni and bought a place in the hold of a tramp steamer going to Cyprus. There were many other refugees, clutching personal belongings such as children and large cardboard boxes with Sony TVs in them. There was some anxiety. We did not know what the Israelis would do. A good atmosphere developed, nevertheless. And, after much delay, the boat left. We chatted, ate sandwiches and someone played a guitar. I remember thinking that this was pretty romantic stuff. I have the tape somewhere. The boat chugged on and we tried to sleep. I dozed off. A klaxon and glaring lights woke me. It was an Israeli destroyer with its searchlights on us. They did not blow us out of the water, though there were some tense moments. We were forced to return at once. This was a blow, not least because I had run out of cash and was still concerned about the PLO. I remember sitting pondering my fate in the abandoned fun fair near the harbour. A student offered me another funny cigarette (there was a lot of it about in Lebanon), I was happy just to chat. Meanwhile, someone has opened the go-kart track and was chasing around in a lone kart. An Israeli plane was putting out its foil to distract missiles above. The whole scene was in the shadow of a huge crucifix. I was just happy to talk and try and get my act together again. I heard about another boat, a British boat, Sea Victory. It would cost another $100 which I did not have. London was a bit of an anti-climax after all this. I sat down for several years and wrote a book about Lawrence of Arabia (recently back in print - look under my name at Amazon). It was, effectively, stolen from me by a New York publisher that went bankrupt under a Chapter 11 order. I never got the money due to me. It was time to plan another trip. Africa this time. I have not the space to tell you about those adventures, save to say that I ran out of money once again, enjoyed accommodation at 25cents a night, got arrested on the Tanzania/Zambia border and was mistaken for the European half of an ivory smuggling ring. My next big operation followed my second divorce (who would want to live with a journalist). Afghanistan via Pakistan. 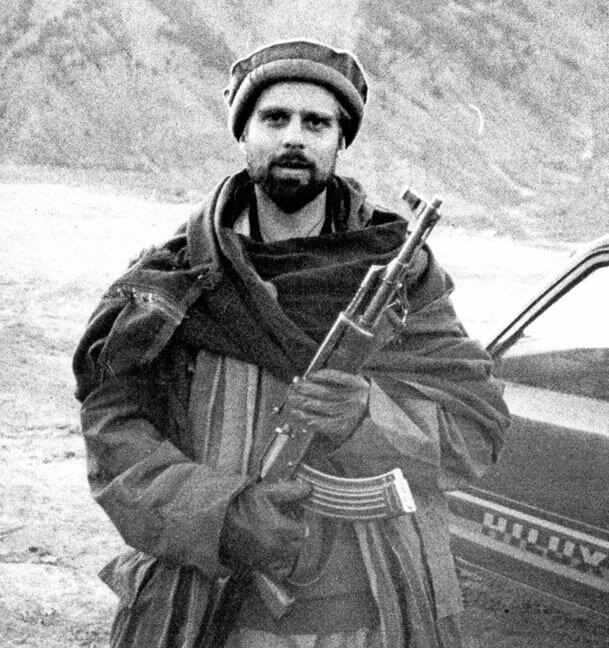 It was the height of the war with the Soviets and the Mujahadeen seemed to be having all the fun without me. Now, this is quite a long story too. Let me concentrate of a few highlights. I put a team of adventurous types together in London. These included another experienced hack and an assistant who was the son of a retired Pakistani diplomat (who later give us up to fight with the Mujahadeen). 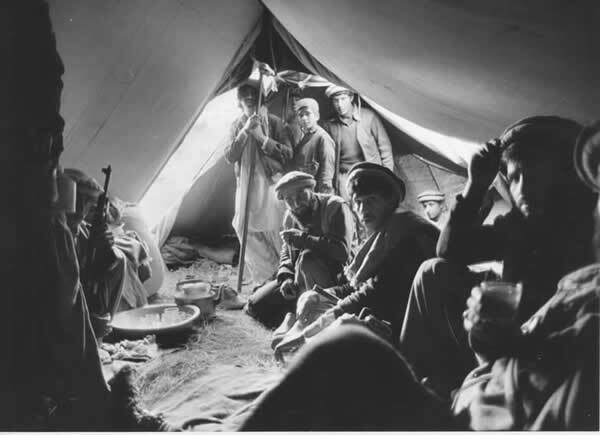 The plan was simple, get to the North West Frontier province of Pakistan, make contact with the Muj, cross the border and photograph them going about their merry business. Adventure and, potentially, profit. It works like this. You go to Peshawar, phone a few people. Meet them for tea and wait. You tell them that you are sympathetic to their cause and would like to tell their story to the world. One in six comes back one/two/three weeks later and says that they can organise something. You go to an appointed location and place yourself entirely in their hands. Meantime, you eat drink and be merry (at least as merry as you can be in a dry town where all the local girls are strictly off limits. I did, however, meet my third wife and mother to two of my four children in Peshawar - she was an English nurse running a refugee clinic. It was a colourful place. One soon goes native. I favoured shalwa chemise (the local, very practical, pyjama like costume), an embroidered waistcoat, Chitrali hat, and, for special occasions, an embroidered leather shoulder holster and borrowed .45 revolver). Now, I shall probably be arrested for admitting this, but I once had a competition to shoot out a street light near the American club (where one could get a good burger when the local food lost its charm). The friend and I engaged in this blatant act of vandalism were challenged by a local policeman. Oops I thought. Happily, he just wanted to have a go. That's Peshawar. Although all the guns going off had disadvantages. One wedding party discharging their rifles joyously into the air shot down a Fokker Friendship. Back to business, we met representatives of many different groups. I was chilled by a guy called Gulbuddin Hekmatyar. I liked Abdul Haq (who might well have become a great figure in re-united Afghanistan had he not been hanged by the Taliban.). I did not meet Ahmad Shah Massoud, assassinated before the recent war, but knew many who respected him. By chance, all these guys (or in Massoud's case, his representative) offered us trips “inside”. The first offer was from Hekmatyar. And, against my better judgement we accepted. Not much happened. We did some foot patrolling. Met some clerics. I knocked over the water at a welcome dinner in the hills (and was told by the Mullah “You will be very lucky”). I liked the foot soldiers but distrusted most of the middle management. On our first operation into Afghanistan we crossed a Pakistani check-point at night in a vehicle and I pretended to be asleep. It was interesting because a guard tried to rouse me and I had to snore gently and pretended to be asleep. I had a black dyed beard and a turban and it was quiet a high once we had got through. Although one may use a vehicle to get to a drop-off point, there are basically two ways to get about inside Afghanistan, one walks or goes by helicopter. The former, our method on this trip, had several disadvantages. The terrain is terrible, too many people want to kill you, and there are mines everywhere. I had some interesting new experiences. We walked past a nocturnal fire-fight in which machine gun tracer was exchanged by parties on opposite sides of a valley (I never did find out who was who). I saw and attempted to film (on Super 8mm) various MIG jet aircraft, not to mention a much more threatening, Hinde attack helicopter, rocketing the next hill. This was rather odd. The chopper was six or seven hundred yards away and at 90 degrees to my position. I had seen pictures of them. It was oddly familiar, like the streets of Beirut. The Muj who was with me was not pleased I was flashing a large camera at this dangerous airborne beast. It only had to turn to spoil our day. The shadow of the reaper was seen elsewhere. We visited a village flattened by the Soviets. Everything was rubble - hardly a wall stood. Whilst contemplating this destruction, I noted a puff of smoke about 800 yards left. I did not think much about it until there was another 500 yards right. Being bracketed is not something to be taken lightly. “Incoming”. The next shells fell close, though we had our heads down in partial cover. This would have been about the sixth time I had been under fire and, interestingly, I found myself better able to deal with it. I had others in my care. Blind terror was not the first response. We walked for miles and miles. You have to travel light if you want to cover ground. The Muj do not like staying out at night because they are superstitious. They are, by and large, a friendly crowd. They like to joke, eat sweets and drink tea. We would sometimes stop at tea houses at the side of the dirt track. These were bad places because they often had spies in attendance. The upside was that one could stock up on sweets and batteries and even get a bit of rest if one took ones chances with the flea infested blankets (safe houses were much to be preferred). Retrospectively, my most serious trip inside Afghanistan was with a man called Waleed Majrooh. Waleed was educated in France (and we communicated in that language). I had met him in Pakistan and immediately struck up a friendship. 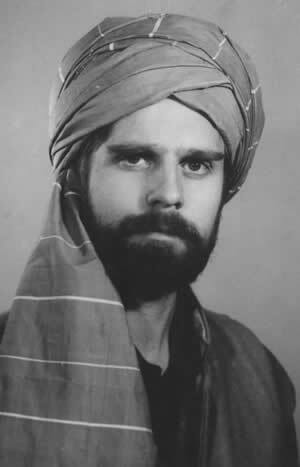 Once honoured by George Bush Snr., he was allied to a group called NIIFA who were not the most effective group, but were planning a major attack on a large Afghan Government base. To cut a long story short. We made a clandestine crossing into Paktia province carrying 100 BM21 missiles. We would launch them off crudely constructed, wooden aiming platforms, detonating them with batteries. No one bothered to take any sort of cover when we reached the objective. After opening up on us with a heavy machine gun, the defenders thought better of it, got in their shelters and waited for us to go away. We remained perched on a mountainside for half a day drinking tea, breaking walnuts and firing misiles. If a chopper had arrived we would have been sitting ducks. On the way into Afghanistan, Waleed slipped and dislocated his knee. It was very steep. Happily he fell on a rocky ledge. I managed to get to him, administer some Valium substitue by syringe and, after an agonising ten minutes, reduce the dislocation (I had planned that something similar might happen to me after recurrent dislocations of my shoulder hang-gliding and skiing). We strapped his leg to an old Enfield rifle and, most bravely, he limped in and out of Afghanistan taking some of the world’s worst terrain in his painful stride. The post script to this story occurred some weeks later when I was chatting to a girl and her friend in my hotel (thrilling them with war stories!). There was a commotion outside, then another in reception, a bunch of desperados had climbed out of a Toyota truck complete with bandoleers of bullets, AKs, and all the rest of the typical Muj gear. They came from room to room searching. I was concerned, all the more when they found us and looked at me as if I was just what they wanted. “Mr Michael, Waleed has hurt his knee again, you must come now, he does not trust these Pakistani doctors.” Evidently, I had made my name. When I last heard of him, Waleed was an accountant in Atlanta. Perhaps the oddest thing I encountered in Pakistan, apart from the Afro-American Mujahadeen from Washington DC, was a group of Japanese martial artists who were also members of an extreme nationalist party. Some of their compatriots had arrived in town a few weeks earlier with throwing stars, swords, and, believe this or not, black hang-gliders. They disappeared, after being ambushed by some wicked journos. The hacks got them outrageously drunk in the bar of the one (very expensive) hotel that sold booze. The next day of Ninjas there was no trace. They had, apparently, crossed the border unguided (a really dumb thing to do). I still have visions of some luckless Soviet conscript having a quiet cigarette on a hillside when a highly motivated guy in black pyjamas descends on him from the night sky.